In the Soundview neighborhood of the Bronx, the Arker Companies has commenced the affordable housing lottery process for their latest ground-up building, Colgate Close. 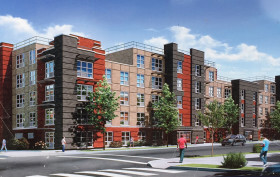 Located at 1092 Colgate Street, where the semi-industrial area along the Bronx River evolves into a low-scale residential community, the five-story complex will contain 32 studio and one-bedrooms targeted for low-income households earning between $25,200 and $30,250 for a single person and $27,052 and $41,460 for two people. Depending on income, studios will be priced at $696 or $847 per month and one-bedrooms at $749 and $910 per month.